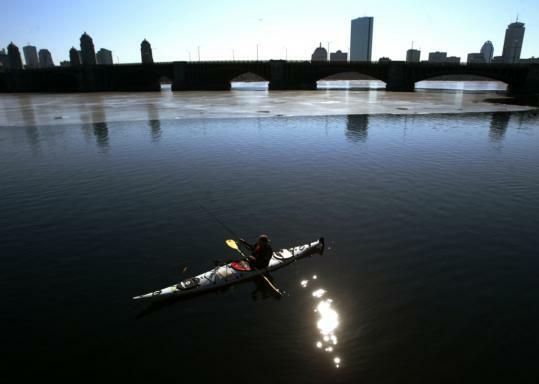 The water it still murky and its shores are still home to the occasional beef jerky wrapper, plastic bag, and empty bottle, but federal environmental officials said yesterday that the Charles River is the cleanest its been since they began monitoring water quality in 1995. "I'm usually pretty good at distinguishing between gross and dangerous," said Frans Lawaetz, who spends his summers windsurfing on the Charles and last year organized the first swimming race there in 50 years. "There's certainly gross stuff in there, but I haven't noticed anything dangerous." The river scored a B++ from the Environmental Protection Agency this year, meeting boating standards 100 percent of the time and swimming standards 63 percent of the time, slightly better than last year when the river was safe for boating 90 percent of the time and for swimming 62 percent. The water has been in the B range since 1999, but in that time local scientists and activists have developed a clear idea of what needs to be done to make the river pristine, said Bob Zimmerman, executive director of the Charles River Watershed Association. "In the next two to three years, we are going to see significant changes in water quality," he said. While the river is undeniably cleaner than it was in 1995, when it was suitable for swimming just 19 percent of the time and boaters who fell overboard were advised to go to the hospital for a tetanus shot, some say they still prefer to enjoy the river simply by looking at it. Though Back Bay resident Paul Powell often walks from his Back Bay home to the Esplanade in the summer to read the newspaper by the river, he looked horrified when asked if he would stick his big toe in it. "Uh-uh," he said, shaking his head emphatically. "No, no, no." Last summer, 68 people took part in the first swimming race in the Charles in more than 50 years. Participants were warned that they might encounter flotsam and jetsam, and a shower was on hand to rinse off afterward, but there were no complaints, Lawaetz said. "Everyone seemed to have a positive experience," he said. "No rashes." So much progress has been made that Zimmerman, Lawaetz, and other community activists have started looking at how to reintroduce swimming to the Charles. Planners have had to get creative, since the river's sediment is full of centuries-old toxic waste. One idea being discussed is a swimming pool that would sit in the river, separating swimmers from the riverbed with a plastic liner. "We are talking about whether it should be done and, if so, where," Zimmerman said. Meandering for 80 miles through the Greater Boston area, the Charles was once a source of food for Native Americans who built fishing weirs in what is now the Back Bay. Then came English settlers, who as early as 1656 passed an ordinance that allowed for the dumping of "beast entralls and garbidg." Over the next 300 years, sewerage and industrial waste flowed freely into the river. Toxins colored it pink and orange in spots. Fish kills, submerged cars, and rank odors were common. In a 1955 article for Harper's magazine, Bernard DeVoto described the Charles as "foul and noisome, polluted by offal and industrious wastes, scummy with oil, unlikely to be mistaken for water." Things took a turn for the better in 1995, when John DeVillars, then administrator of the EPA's New England region, launched a massive cleanup aimed at making the river swimmable within 10 years. Since then, the Massachusetts Water Resources Authority has helped communities to separate some combined sewer systems and built a new Deer Island Treatment Plant. Last year, they completed installation of a 57-inch pipe that stretches from Brookline to Cambridge, improving the flow of waste to Deer Island and reducing overflows into the river during heavy rains. "We need to go that last mile on reducing the amount of bacteria sent into the river," EPA spokesman Ken Moraff said. Still, problems persist in New England's most densely populated watershed. For the past two summers toxic blue-green algae blooms caused by phosphorus have exploded in the river, putting humans and animals at risk. Rules aimed at reducing storm-water overflows and phosphorus pollution introduced by the EPA last October should improve the situation, Moraff said.